Pigeons are stout-bodied birds that are common in large cities. The most common type of pigeon found in urban areas is the feral rock pigeon, which has a short neck and slender bill. Because pigeons procreate in large numbers, they have come under scrutiny in many cities, and the feeding of wild pigeons has become illegal in many urban settings. Pigeons require a very specific diet in order to maintain their health, so whether you're feeding pigeons in the wild or in your own coup, you should be careful what you do and do not feed them. In order to maintain a healthy diet for a pigeon, you must emulate the grain intake they would get in the wild. Avoiding foods normally reserved for people, like bread, cheese and meats. Wild pigeons eat a diet filled mainly with non-fiber items like grains and seeds. Bread is one of the most common foods that people feed to pigeons, but the complex carbohydrates in bread offer no nutritional value and could even work to starve them. Because pigeons do not have teeth, they require a supply of grit in order to digest their food. Pigeons digest and break down food through the use of the crop, which is a sack at the base of their throat and a gizzard, located at the bottom of the intestinal track. In order for this system to work, pigeons must eat small stones and rocks, along with their food, in order to survive. Wild pigeons will get the right amount of grit naturally when they gather grain and seeds, but domestic pigeons must be fed processed shell grit along with their normal diet. Foods required for a healthy pigeon include dried field peas and corn. They are high in protein and help build strong muscles and maintain a pigeons plumage. Corn, however, can store in a pigeon's body as fat, so it should only be fed to a pigeon in limited quantities during the winter months. Wheat and sorghum are staple grains for wild pigeons and can also be found in domestic pigeon seed mixes. Some wild pigeons eat small quantities of green plants as well. A full-grown pigeon will eat about 500 g of grain each week. A common myth claims that eating uncooked rice will cause a pigeon to explode. The myth claims that pigeons are unable to digest the grain and when it expands in their stomachs, it has nowhere to go. In truth, birds often depend on flooded rice fields for feed while migrating north, and animal biology experts say that uncooked rice is no different than that which birds feed on in the wild. Pigeons require much more water than most birds, especially during breeding season, so dehydrating foods should be avoided. Salt can dehydrate pigeons, but pigeons love salt, and will attack salt blocks reserved for pigs and sheep. Human food, especially meats, are very dangerous for a pigeon's health. 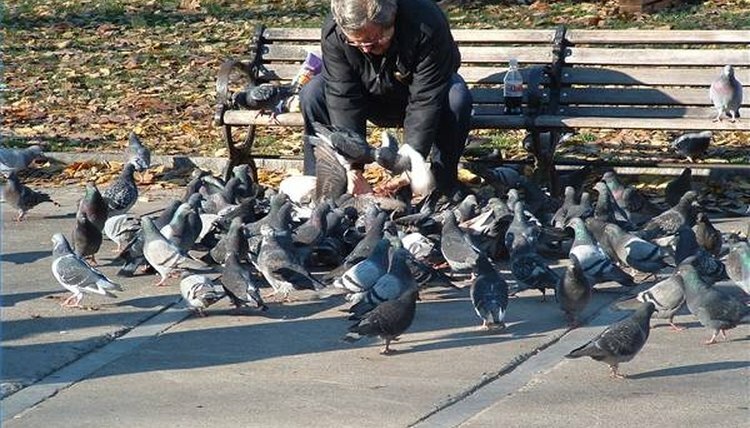 Human food can introduce bacteria to pigeons that they are not capable of fighting off. Diseases and health risks aside, feeding pigeons in the wild can make them dependent on human feeding and less likely to seek food on their own. Human interaction and improper feeding of domestic and wild pigeons is believed to be one of the reasons for the birds' decline. While many urban areas claim that pigeon populations are out of control, the truth is that around 59 species are currently threatened by extinction, which is over 20 percent of the pigeon population. Since the 1600s, 10 species of pigeon have become extinct. While habitat loss and over-hunting are partly to blame, bird specialists believe that domestication and improper feeding has weakened the entire species.